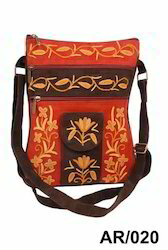 We offer you best varieties of Kashmiri hand-embroidered ladies shoulder bags,pp bags,coin pouches,evening bags,party bags,Collage bags made by best artisans of Kashmir in Ethnic Kashmiri designs and styles.Our bags are full of craftmenship which are not only unique but are in class of excellence. Ladies Designer Leather bag offered comes in smooth grained leather construction finish and can be made available in choice of different colors so as to match up with the specific demands of the customers. The beautiful designer and shiny finish of these bags as well as availability options in different sizes and designs also allow us to meet the preferred choice of customers. Some of its features include available in different sizes; provide for enhanced usage appeal; eye-catching designs and attractive color schemes. 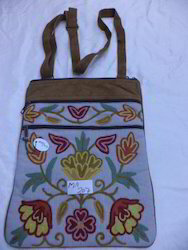 Ladies Suede Bags offeredcome in superior designer looks and in attractive embroidered patterns which make these bags look even more exclusive and enchanting. Featuring multi-compartment support and durable shoulder strap, these bags match up to the tastes of fashion conscious ladies. Some of its features include available in vibrant color shades; provide for superior aesthetic appeal & splendid looks; reflect the vision and imagination of craftsmen; attractive patterns carved out from quality material for durable usage value; options of many sizes and designs to choose from. To satisfy our clients, we are engaged in offering an extensive array of Ladies Designer Bag to our esteemed customers. Our offered products are widely appreciated for its safe use. Our product has excellent quality and it is highly reliable in nature. Ladies Designer Bag is available in various size and styles at pocket friendly price. Ladies Designer Bag is appreciated among the customers due to its soft texture. Ladies Designer Suede Bags offered come in vibrant color options as well as in fine suede finish quality that adds a touch of sophistication to these designer hand bags. Further, the fine stitching work designer look provided to these bags also assist in enhancing the finish appeal provided to them. Some of its features include elegant designs and intricate pattern options; provide for exclusive designer appearance; choice of various styles, finish and designs to pick from; smooth surface finish. 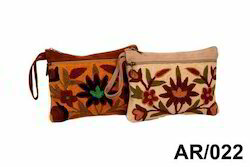 We offer varieties in ladies coin pouches in crewel,chain-stitch with suede and we are also making exclusive shoulder bags, PP bags, paris bags and mobile case with hand-embroidery. 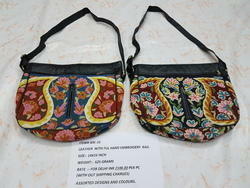 We offer variety of fancy shoulder bags with hand-embroidery on velvet and on silk fabric. 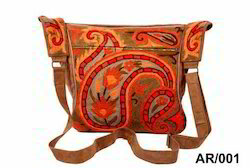 Our range also includes Leather,suede,cotton,Velvet ladies shoulder bags. To match up with the changing trends, we have come up with an enticing range of passport Bags. Our passport bags have been designed to serve the purpose of carrying passport and other neccesary journey documents , but at the same time making these an ultimate fashion statement. 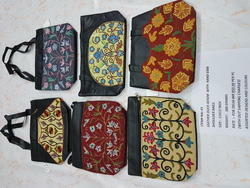 These passport bags have contemporary embroidery work in spectrum of colors and designs. We are engaged in offering a wide collection of Pure Leather Hand Bags for our clients spread across the globe. Embellished with various pearls and beads, all our bags are available in various colors, shapes, sizes and designs. These are neatly stitched and are offered at industry leading prices. 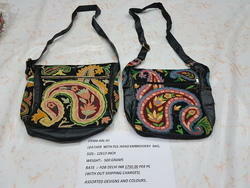 We are offering a classic range of Baroque Bags that is intricately designed with bead and sequined work. These are economically suited to all classes and genres of women and come in different styles, shapes and designs to match the personality of the user. We offer these in both standard as well as customized patterns. 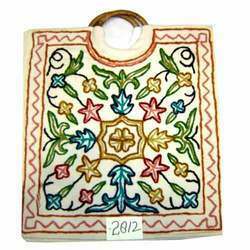 We are a well known organization offering comprehensive array of Spiral Embroidered Bags. 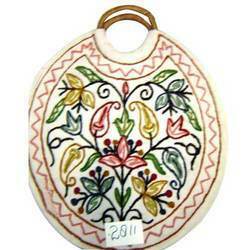 These embroidered bags are made from premium quality of raw material and are long lasting. Depicting the appreciable needle work of our team, these bags are available in host of appealing designs, colors and sizes to choose from. 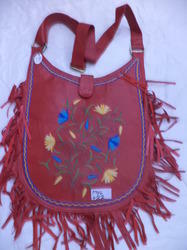 Our bags go with all types of clothing and are available at competitive pricing. These are offered in a set of 5 pieces. Our skilled artisans specialize in offering a wide collection of Wooden Handled Embroidered Bags that is manufactured using quality yarn. Innovative designs of embroidery are created in various contrasting colors that are in trend. 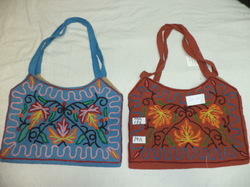 These hand embroidered bags suit every occasion and can also be embellished with colorful beads. We bring forth a wide range of Tote Bags that is Classic as well as stylish. These bags are available in different interesting shapes. From oval, round, square, trapezium to the plane rectangular shapes, these bags befit the varied choices of the individuals.